In a race to find out what great pressures confront life in our ocean, the team continue their mission across our blue planet to investigate the effect human impact has had on our fragile marine ecosystem. As the sun rises over the Great Barrier Reef, Liz Bonnin joins scientists live to find out how temperature rises are impacting the reef, and how plastic is putting the future of the planet’s turtles at risk. 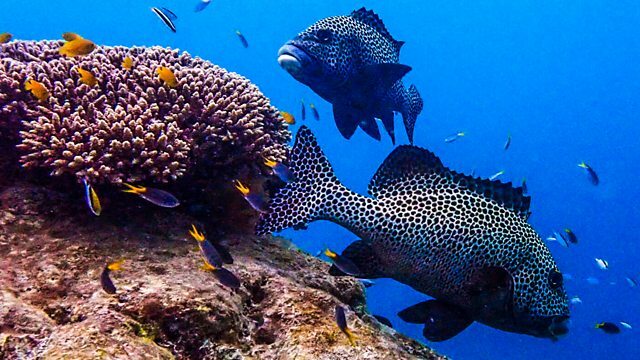 In a dramatic manoeuvre to capture coral spawning, we follow an ambitious attempt to restore the reef through IVF. 15,000 miles away Steve Backshall explores an eerie Caribbean wreck, during a live dive, in search of a super-sized fish that is upsetting the natural order in the shark’s home waters. Continuing his journey down the Baja peninsula in Mexico, Chris is on a quest for ocean giants; are this year’s blue whale families are in good shape? He helps researchers deploy a ‘snotbot’ to make their diagnosis. Out in the pacific the crew on board expedition research vessel, Atlantis, explore the mysterious world of the deep ocean. Their findings will help them assess the health of ocean and find out how our actions are impacting the deepest, darkest, depths. Visit OpenLearn, The OU’s home of free learning, to learn more about our blue planet.